Guided tours: noon, 1 pm (Monday-Friday), 4:30 pm and 5:30 pm (Monday-Thursday). Self-guided tours: 3 pm and 8 pm (Friday), 11 am and 8 pm (Saturday) and 11 am and 7 pm (Sunday). The tour of the stadium doesn't depend on weather conditions. We are comparing Wanda Metropolitano Stadium Tour Prices from leading ticket suppliers and Try to find you Cheap tickets prices on the market. A guided tour of the home stadium of Atletico de Madrid - Wanda Metropolitano. A chance for fans of the club to visit areas of the stadium that aren't usually open to visitors. An informative activity that highlights celebrated moments in the history of the football club. A unique opportunity to visit dressing rooms, the football pitch and VIP stands among many other facilities. A tour that introduces players that brought fame to the popular football club of Madrid. If you are a fan of FC Atletico de Madrid, the guided tour of its stadium is a must-do thing for you in Madrid. Even if you aren't emotionally connected to the FC, you should take the tour for an insightful overview of the stadium. Every fan of football should enjoy the tour of the modern stadium. 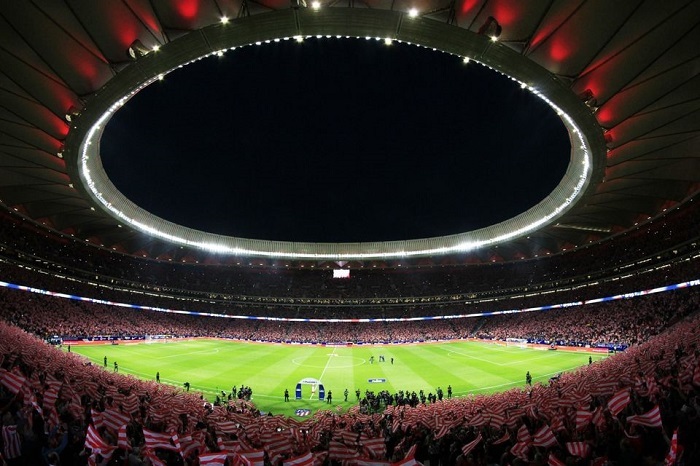 Your Experience With Wanda Metropolitano Stadium Tour? Take a tour of Wanda Metropolitano, the home stadium of FC Atletico de Madrid, from outside and inside. Walk premises of the stadium normally reserved only for football players and officials, such as tunnels, pitch and dressing rooms. Have an opportunity to take a look at the press rooms, the VIP stand and the mixed room. Get an overview of the club's celebrated history, big matches and illustrious players. Visit the Walk of Legends that honors players that played at least a hundred games for Atletico de Madrid. Get a chance to buy a suitable souvenir at the dedicated store of the stadium. What Wanda Metropolitano Stadium Tour Includes? Several start times for you to choose from on a daily basis. A priority entry to Wanda Metropolitano Stadium. A friendly guide that knows a lot about the football club. Guided and self-guided tours take place at different times throughout the day. Tours led by guides are held in English and Spanish simultaneously. Travelers Reviews about Wanda Metropolitano Stadium Tour? Comparing the comments of travelers that took guided and self-guided tours, it appears that all of them had a great time while visiting Wanda Metropolitano. According to their comments, tour guides perform greatly and the stadium is a must-see for fans of football and the club. Reviews of a few visitors reveal that they didn't have a problem to enter even when they purchased tickets shortly before the visit. Some visitors liked the fact that the stadium was less crowded during their visit than Santiago Bernabeu (FC Real Madrid). Get in touch with the provider of the tour for details regarding visitors with disabilities. You may show an electronic or paper voucher to participate in the guided tour. You may receive the refund for cancellations depending on the chosen tour operator. Confirm the schedule on a day when a match or other event takes place. Duration: Around 3, 3:30 hours. Duration: The duration of the pre-recorded commentary is around 45 minutes.